This week JB Well Solutions delivered to a European Customer the world’s first well service pump unit (WPU 700) for use in hazardous area (Zone 2) that is certified by Notified Body to the new DNVGL-ST-E272 standard (former DNV 2.7-2). Offshore service modules certified to this standard are designed to perform temporary services on offshore installations and may be placed on different offshore installations and units in different national waters. This unit has NO deviations to current standards and regulations which gives our Customers better flexibility to their pump fleet. Global utilization possibilities with this type of equipment provides higher value for money for our Customers. In addition, these units have better operational safety, easier operation, and network pumping capability, with better access for maintenance making it an excellent investment for our Customer who is a global player in the well service market. Automatic ambient temperature regulated fan speed (lower noise level). Automatic regulated power output based on ambient temperature (additional performance at lower ambient temperature). Engine and transmission electronics certified by Notified Body. Remote control panel (Zone 1) with 35m cable. Prepared for pump grid operation (connect many pump units together and operate from one panel). Easy access to maintenance, double doors on each side of the unit. SIL certified safety system gives documented better operational safety. Certified to operate without exhaust flame traps. Control system : Electrical, PLC based. Diesel Capacity : 8-12 hours. Sound pressure level : 79 dBA (SPL). Test method ISO 3746-2011 (E). 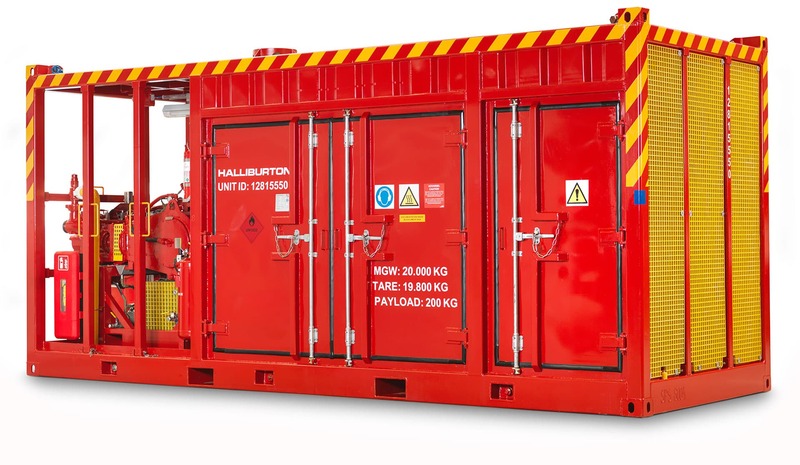 Certified according to : NORSOK Z-015, DNV 2.7-1, DNVGL-ST-E272, CE and ATEX. Third party approval : DNVGL. ATEX code : Ex II 3G IIA T3. Ambient design temp : –20° C to +40° C.